Look who has risen from the dead and crawled out of his tomb? It's the mummified scream! This Adult Mummy Ghost Face Costume is a scary costume for you that allows you to be a mixture of both a ghost and a mummy. Pick up a toy weapon to pair with this costume to make it more menacing. Its Sydney’s nightmare come true, Ghost Face and he’s back from the dead! Transform into the infamous and reanimated masked killer with an Adult Zombie Ghost Face Costume. Who says butchering teenagers should ever have to end. This mummified scream has been locked away for far too long and he's ready for a murderous rampage. This costume is cool because it puts a new spin on an iconic costume. All you need is a toy weapon so you can start chasing your friends around with it. I bet they run in fear! The sunken in eyes, the hollow mouth, the pale skin, you know the face! This face most likely haunted your dreams when it made it's movie debut back in the 90's and now it's back! This time you can turn on MTV on Tuesdays nights to catch the psychopathic serial killer. This time he is terrorizing new high school students. 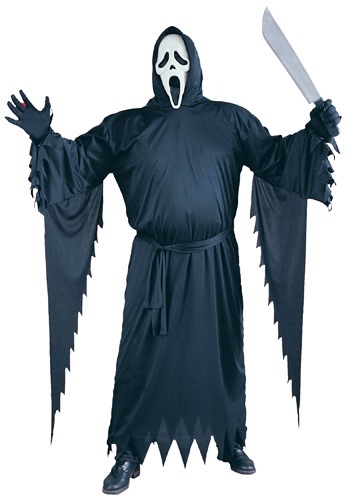 Wear this MTV Scream Adult Costume, get out your cell phone, and find that old voice changer. You're ready to make the most epic prank phone calls of your life and inevitably scare the daylights out of the person on the other end of the phone. Ghostface was scary before, and he's scary now on the new MTV show Scream. this Scream Child Costume recreates the classic horror character so they can scare the pants off the neighborhood this Halloween. What's your favorite scary movie? Now you can become the icon of modern scary movies when you wear this Plus Size Scream Costume. With an weapon and a good hiding, spot your friends will be scared to death when they see you. Let the killing spree commence!